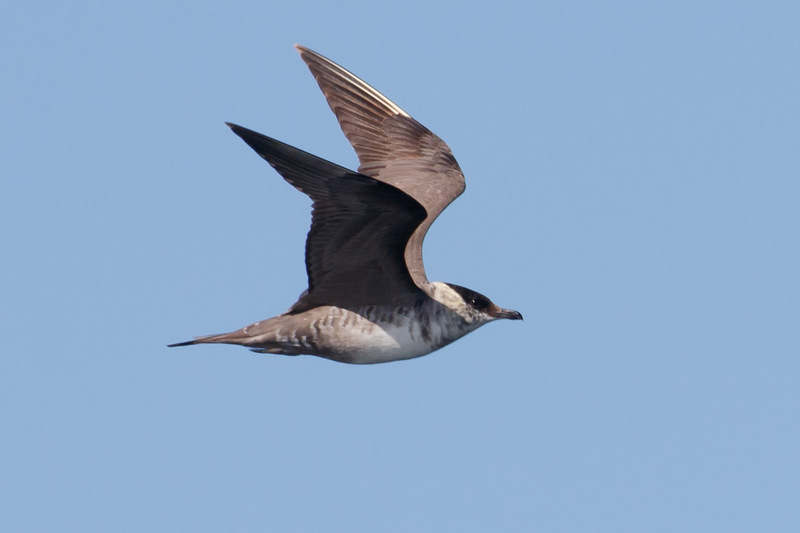 Part of the fun of the Oregon Shorebird Festival is the pelagic trip. 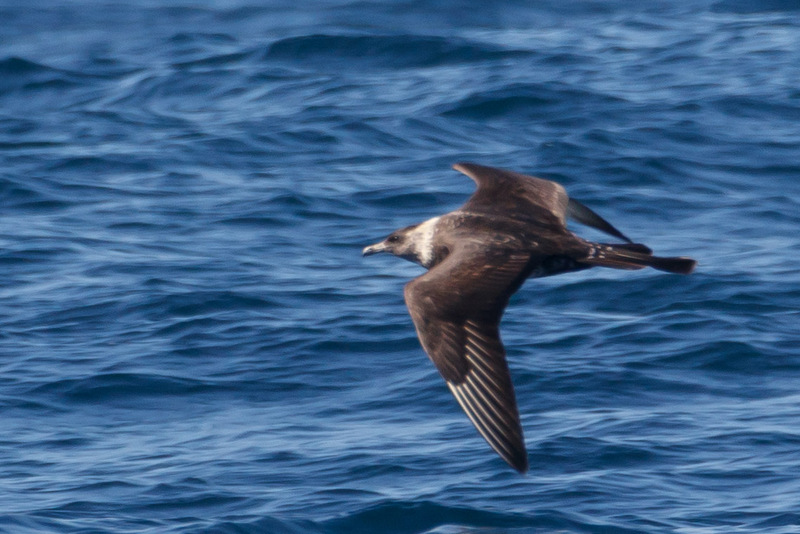 After my first disaster of a pelagic experience in 2015 I wasn’t sure I’d ever do it again. But since then I’ve had a couple of successful trips, and after loads of trial and error (and meds) I feel like I’ve finally got my system dialed in. I’m not saying it’s 100% barfproof, but it’s getting there. Having the right gear and knowing what medication combination works makes the biggest difference for a pleasant ride. This next trip would be my shortest, only 5 hours, less time for “complications” and a good test for my recovering ankle. 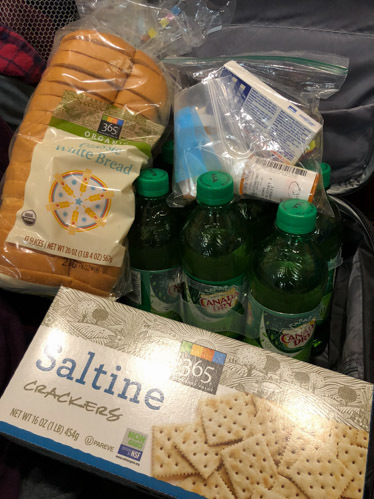 I felt pretty good boarding the boat as we set off from Charleston. 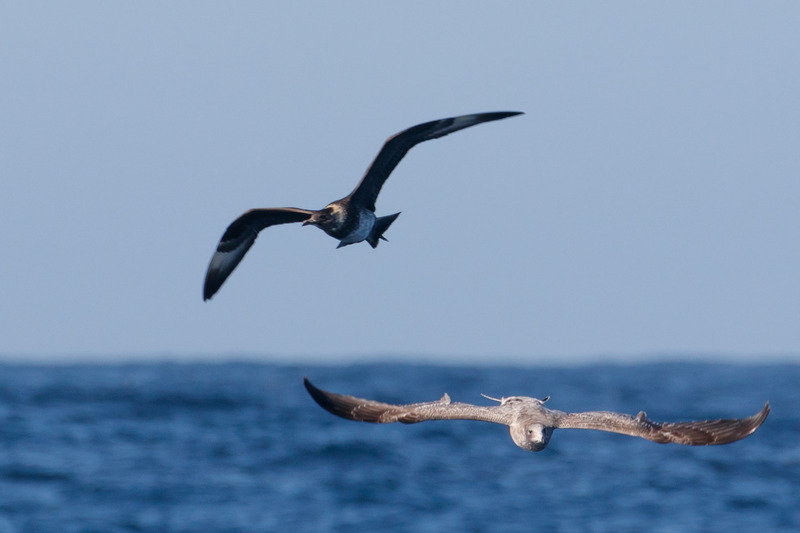 Oregon Pelagic Tours has the best guides, they’re my favorite people to be out at sea with. 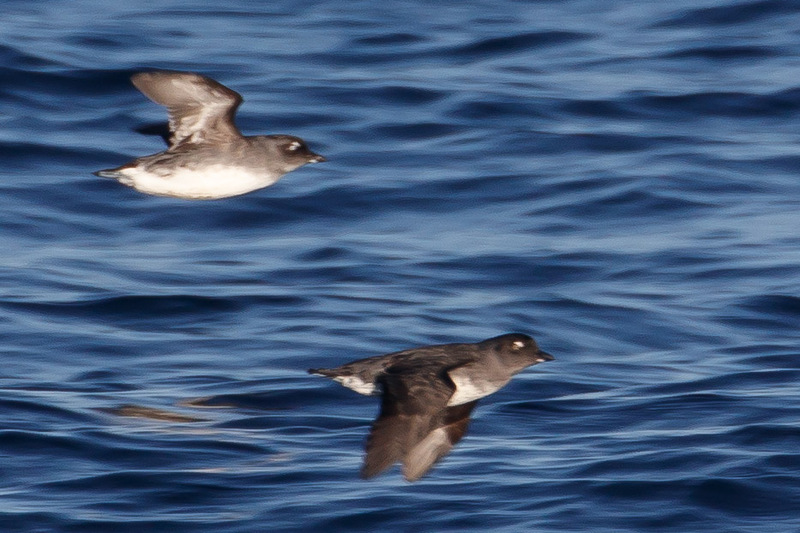 Our trip began just past the jetties when we saw Rhinoceros Auklets, Red-necked Phalarope, Marbled Murrelets, and Cassin’s Auklets. Before I knew it we were in Sooty Shearwater territory. And not far behind we got a quick look at terns, a Common Tern, with a small dark bill and dark carpal bars (shoulders). 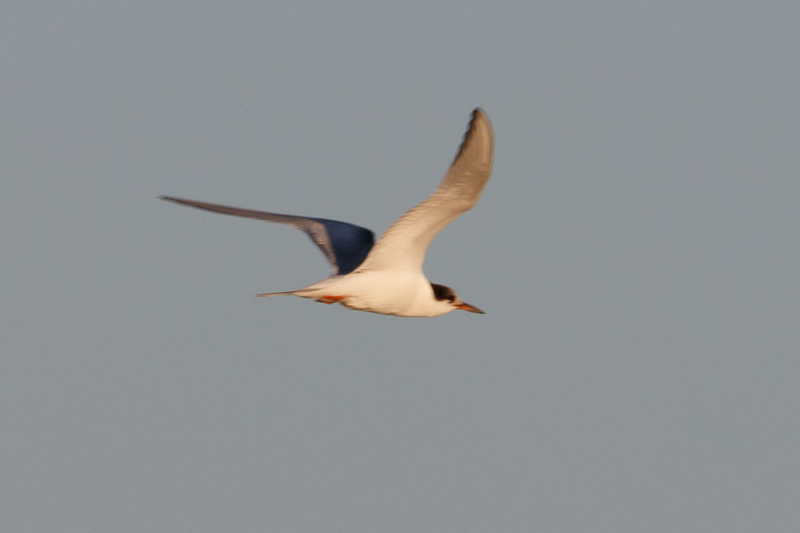 And a second tern that was first I.D.’d as Elegant until it was examined more closely in photos after the boat ride. 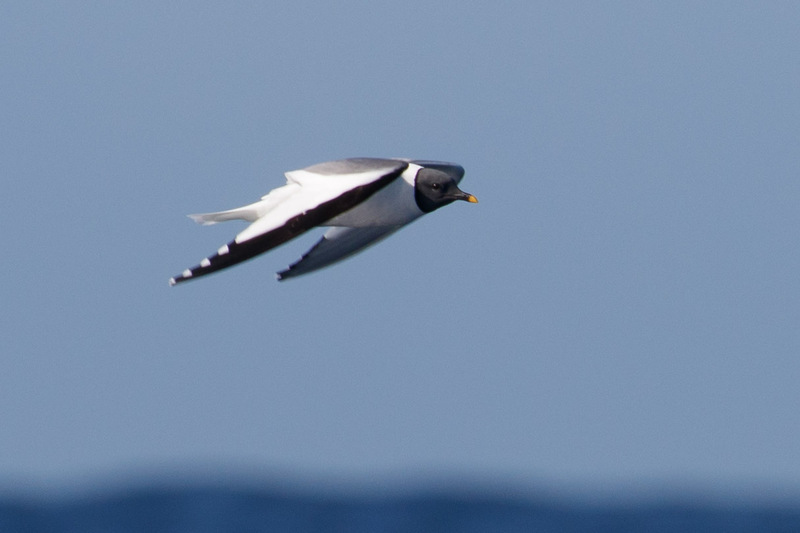 It was thought to be Elegant because of the clean underside and perceived longer bill, but despite this, experts now agree it is actually a Common Tern, as adults transitioning into non-breeding plumage can have red at the base of the bill. Not quite Elegant enough and a very tricky tern. Eventually we found fishing ships. 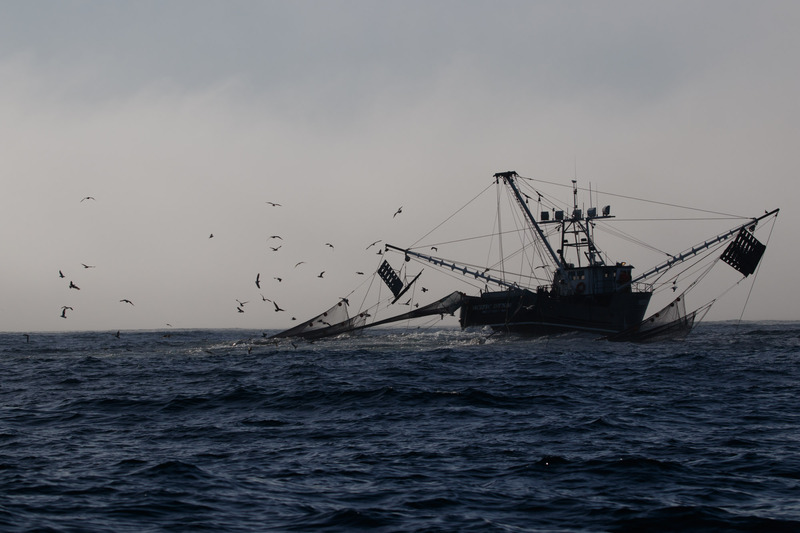 And lucky for us they were just pulling up their nets. It was a perfect time to chum the waters. Chum brings the gulls, which brings the jaegers! We saw all three, a jaeger slam. I’ll start with the easy one. 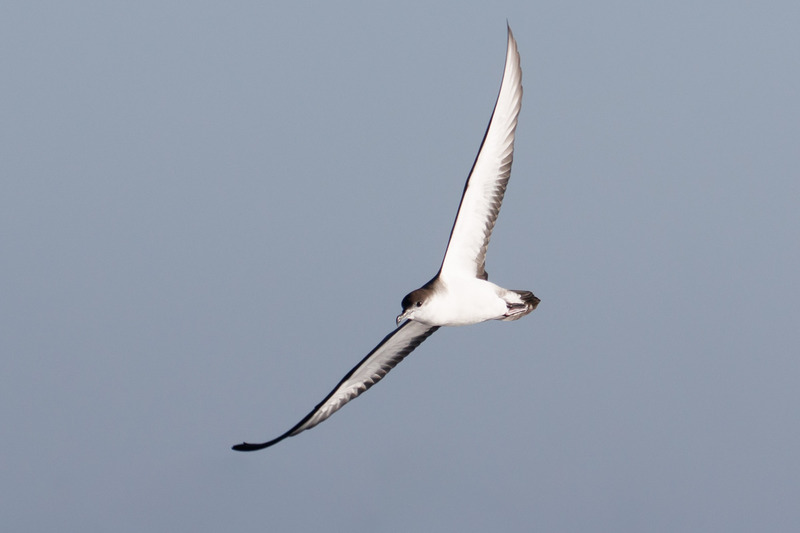 Large, beefy bird with a bi-colored bill, and the largest white wing “flash” on upper and lower wings (6-8 white shafts on outer wing feathers): POMARINE. 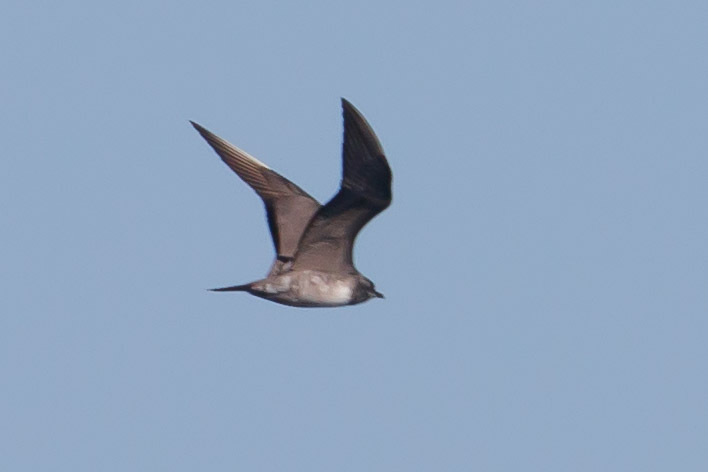 The next jaeger, wing flash is visible, more than two shafts in the upper wing, and a close-up of the bill reveals the gonydeal tip is near the edge: PARASITIC. There are only two white primary shafts on the outer primaries. That is diagnostic for: LONG-TAILED. 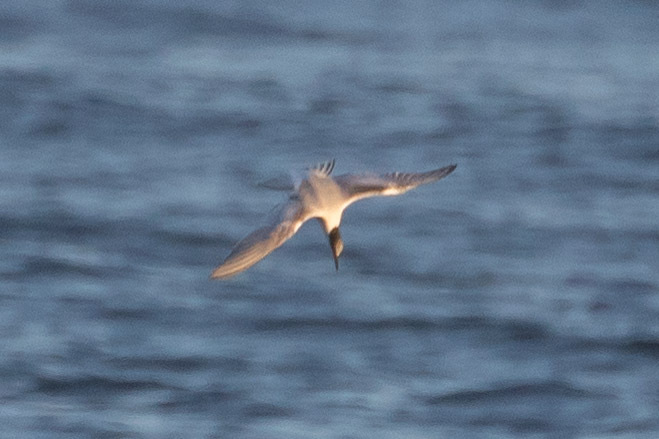 It also has black and white barring underneath the tail, and a small bill with gonydeal tip in the mid-point, but the minimal flash is what to look for. I thought tail shape was the main factor in jaeger ID and it is helpful, but angles mislead and feathers break. It’s all about the white on the wings and bill shape for jaeger ID. My goal is to eventually learn enough to be able to do more in the field besides hang on for dear life. Clearly I need to spend more time on the boat. 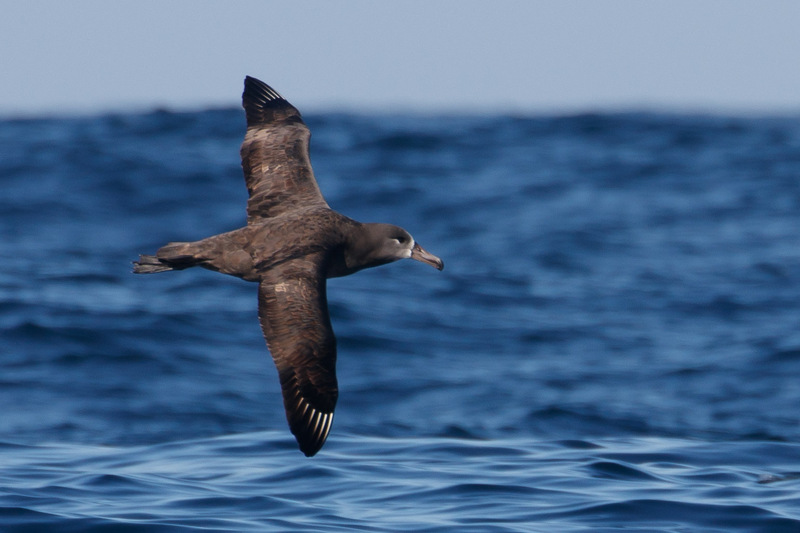 If not for jaeger identification, then to look at more Black-footed Albatross. They were there too, though in lower numbers than trips in the past. 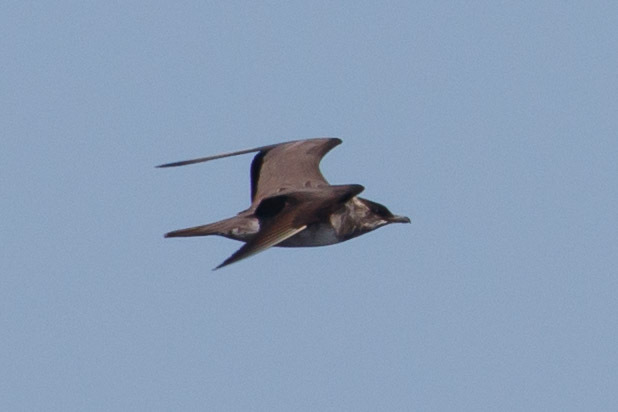 There were higher numbers of Sabine’s Gulls though. Can’t mistake that one. 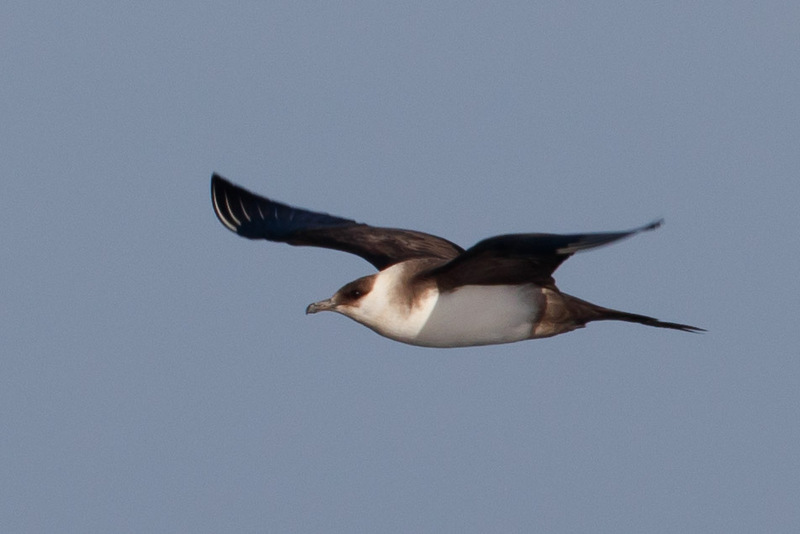 We also got great looks at a South Polar Skua with the Sabine’s! 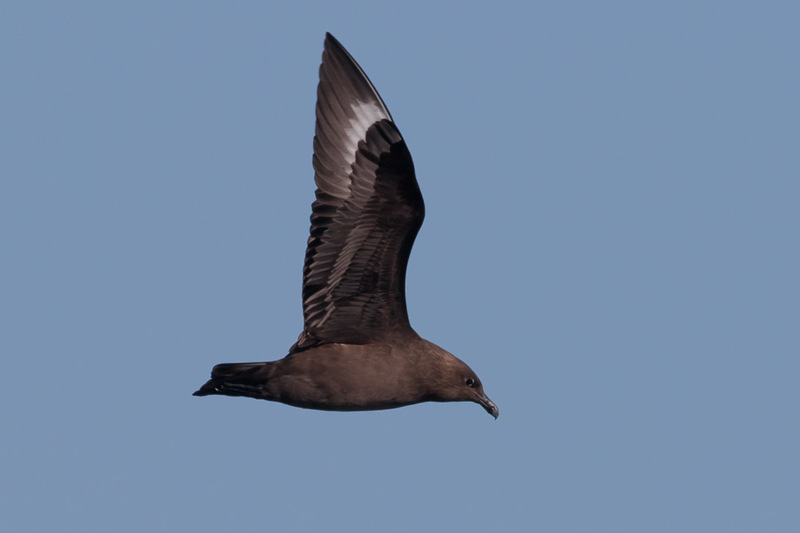 The Skua passed close to the boat several times giving us killer looks. 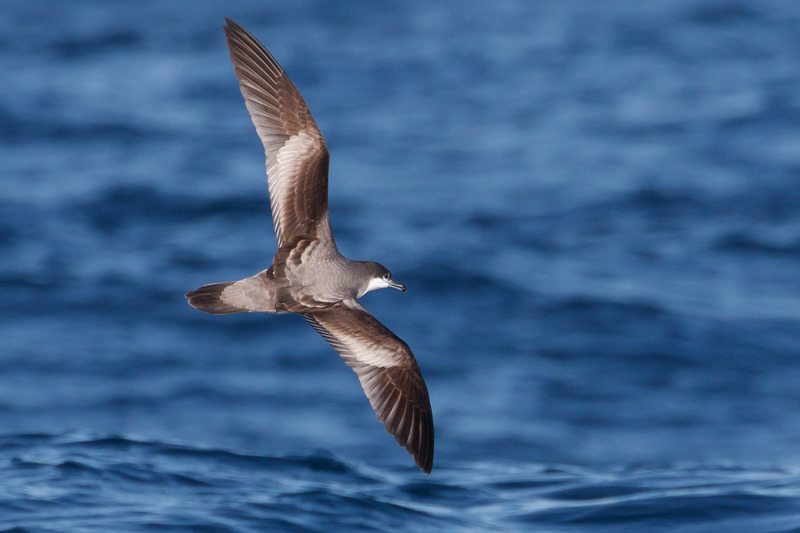 Also amazing were Buller’s Shearwaters, with that clean white underside. Not bad for five hours out to sea! I’m grateful for such an amazing barf-free trip. The weather was milder than predicted and the sea swells mostly cooperated. We had a couple of whale sightings and a blue shark visited the chum spot but I failed to get a photo. 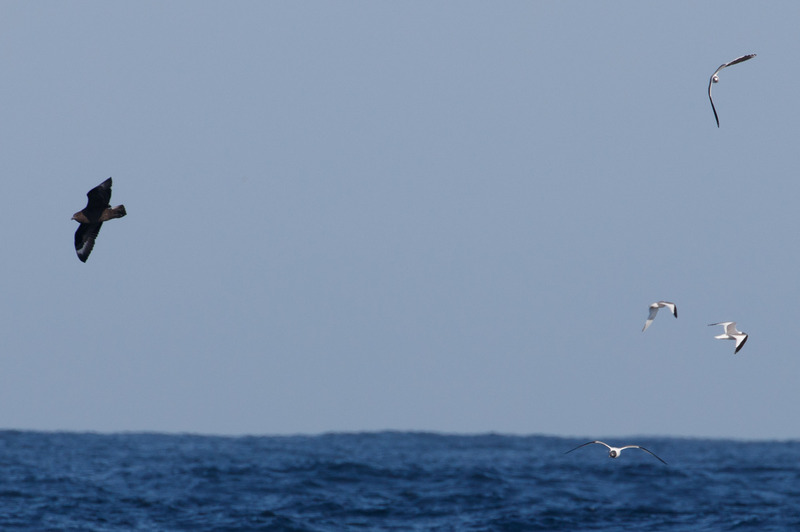 But the birds never disappoint, they’re the best reason to get back on that boat. Good job. Some are impossible. 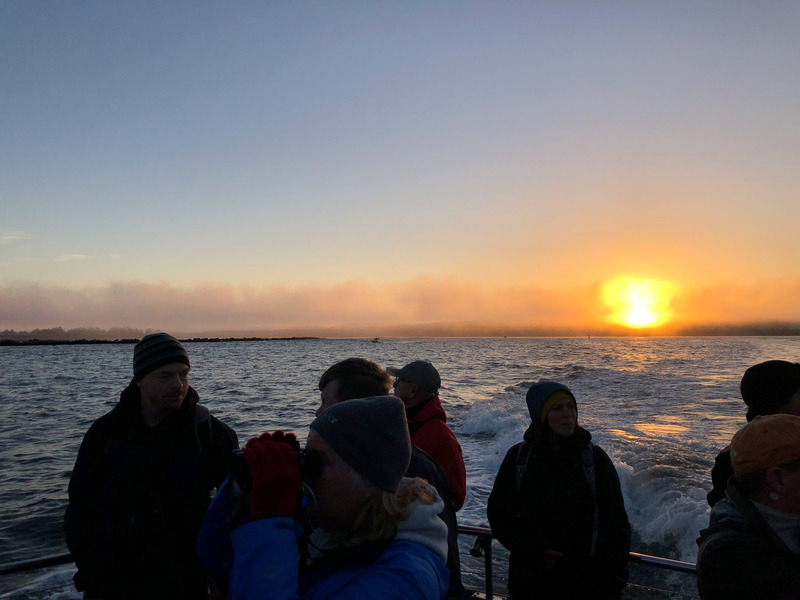 This entry was posted in Birding Trips and tagged Black-footed Albatross, Buller's Shearwater, Cassin's Auklet, Common Tern, Elegant Tern, Long-tailed Jaeger, Marbled Murrelet, Parasitic Jaeger, Pomarine Jaeger, Red-necked Phalarope, Rhinoceros Auklet, Sabine's Gull, South Polar Skua by audge29. Bookmark the permalink. Yeah! I scored on the quiz good info on the Jaegers I get sea sick watching pelagic footage on you tube.